Hello! The bluebonnets are blooming, the garden is growing, and the itch to spring clean is here. I find it odd that I would ever have an “itch” to clean, but I do. It would be so satisfying to chill in a de-cluttered house, with maybe an inch or two of clean floors visible beneath the explosion of toys, books, sharp legos, pots, pans, and kitchen utensils. I found my flour sifter in my bathroom the other day and I didn’t even think anything of it. Oh, toddlerhood. March is also National Nutrition Month!! Did you know that? What better time than Spring to start a new, fresh outlook on healthy food and healthy living. In the spirit of new beginnings and spring cleaning, let’s take a look at our kitchens, the place where all the food in the house comes from 🙂 . As a dietitian who used to inspect kitchens in nursing homes for sanitation, I have always been extra wary of keeping our kitchen clean and sanitary. It has made me ever-so more aware when I happen to glance in through the swinging door of a restaurant kitchen. Sometimes it almost feels like “ignorance is bliss” in that situation, if you know what I mean. But, knowledge is power. While restaurants can be scary, sometimes we forget what germs we are potentially spreading around in our own home. You may have heard the dirtiest place in your house is actually not the bathroom, it could be your kitchen sink. I’m not trying to insult anyone’s kitchen cleanliness, as I’m sure everyone cleans their kitchen, but as a busy mom trying often frantically getting meals on the table, it is easy to spread undesirable stuff around, invisible to the naked eye. Here are some easy tips to make sure you are keeping your kitchen food safe and dramatically reduce your risk for food poisoning – something no one wants. The last time I got food poisoning (from a restaurant of course..) I was pregnant with Matthew and it was terrifying. A $900 ER bill later I was OK, but I hate to think if it was worse. 1. Thawing meat. The safest place to thaw meat is the refrigerator, as you know. Thawing meats on the bottom shelf, in some sort of container is the best way to go. I was in a hurry the other day and threw a packaged frozen chicken in a grocery bag on one of the upper shelves in our second fridge, thinking I would grab it in the next day. Forgot about it until the day after that and found GROSS chicken drippings over everything below. I know better, I was just rushed and not thinking. Needless to say I wasn’t a happy camper, and neither was my hubby who helped sanitize everything. Meat is safe thawed in the fridge anywhere from 2-4 days, but when in doubt, throw out. If you didn’t plan ahead for fridge thawing, as I so often do, running meat (safely sealed) under cold water is OK. What is not OK is leaving it submerged in standing water, a bacteria paradise. Make sure you cook immediately after thawing this way, do not refreeze the raw meat if you change your mind. Microwave thawing is the fastest option when in a bind, but again, it must be cooked immediately afterwards. 2. Live by the Danger Zone. I don’t mean the song, although that would be pretty cool. 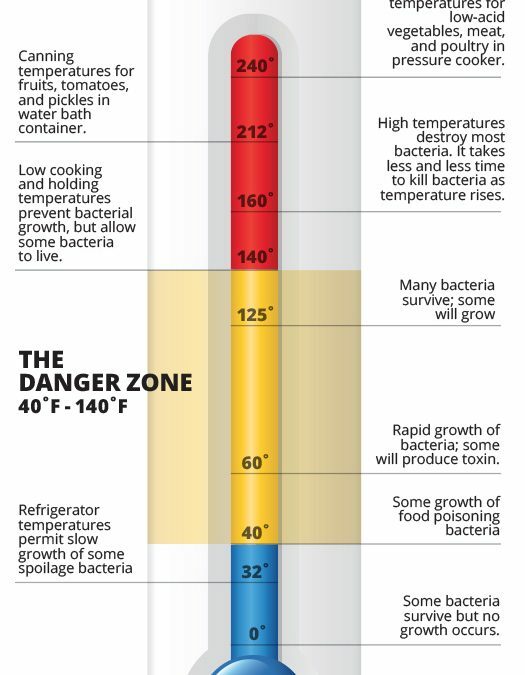 The Danger Zone is the temperature range of 40-140 degrees Fahrenheit and is one of the most important concepts in food safety. 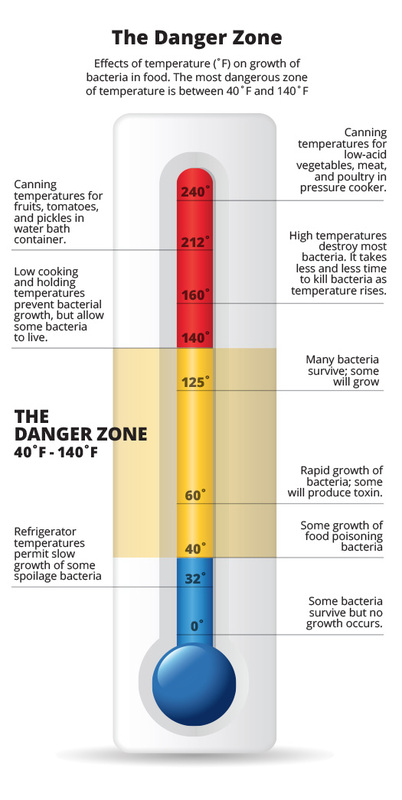 This is the range where you want to minimize how long food hangs out at as this is when bacteria grows the fastest. Cold foods should be kept below 40 degrees, hot foods above 140 degrees. Remember the 4 hour rule. If it has sat at this range 4 hours or longer, toss it. Not worth the risk. Make sure your fridge is holding at least 40 degrees or colder. 3. Wash your hands. Well this is a no brainer, but remember to wash throughout cooking and cleaning up, especially after handing meats before moving on to produce, etc. Make sure you are dedicating a good 20 seconds to hand washing too. 4. Pay attention to produce. Did you know produce causes more food poisoning incidents than raw meat? We tend to be more careful around raw meat. Produce, however, can be deceiving. We tend not always wash fruits/vegetables that have a peel, as we know we aren’t going to eat that part. But, I’ve caught myself slicing into an unwashed avocado or banana and realize I could be transporting bacteria from the peel into the fruit, or all over the cutting board. Don’t wash herbs and produce until you are ready to eat it. Sometimes washing then putting back in the fridge can trap moisture and be another bacteria playground. 5. Separate cutting boards. Have one you use for meats, have one you use for produce. This is a requirement in food service establishments, and I make sure to do the same at home. 6. Don’t wash your meat. This seems counterintuitive, but washing meat (like chicken) in the sink is one of the worst ways to spray droplets of raw meat juice everywhere, even beyond the sink. Cooking the meat properly will kill off anything on it’s own, and will kill off more than rinsing under water would ever do. 7. Clean as you cook. This is a great idea, and saves a lot of time in the end, but be careful. Save the dish towels just for hands, and use paper towels and antimicrobial wipes for counter tops, etc. It’s really easy to wipe up a contaminated counter with a towel and then forget about it and use it on something or someone else later. 9. Three-Day Rule. Toss leftovers in the fridge after 3 days. Dating your leftovers is wise. Use these convenient freezer labels for storing stuff in the freezer. Leftovers can be stored in the freezer 3-4 months for best quality, after that they can lose flavor and moisture. 10. Sponge Safety. If you use a sponge, wash daily in the dishwasher with a drying cycle to kill off 99% of bacteria. Replace it often, especially if it has any kind of odor. Always store in a dry location. Do not use for countertops or for any meat juices. Remember dish cloths are less porous and can be a good option for washing dishes. Just throw them in the washing machine with hot water and a hot drying cycle when you’re done. 11. Be safe. Keep knives in a block, or a drawer the kiddos can’t reach. Make sure pot/pan handles are facing away from the front of the stove and not where a tot could grab one from the top of a stove. If you’re washing knives under soapy water and you get distracted by a jabbering kid covered in spaghetti, warn your hubby there’s a knife in there. Wipe up spills immediately, and always know where your fire extinguisher is. 12. Check out this awesome app: Is My Food Safe? by the American Academy of Nutrition and Dietetics. 13. Again, when in doubt, throw it out. I know we don’t want to waste food, but if you have even a smidgeon of a suspicion it could be bad, don’t risk it. It’s not worth a $900 or worse ER bill, trust me. Do you have any specific food safety questions? Comments? Give me a shout! Also check out www.food4success.com on how to reach me for nutritional counseling or to get a schedule of upcoming nutrition classes.